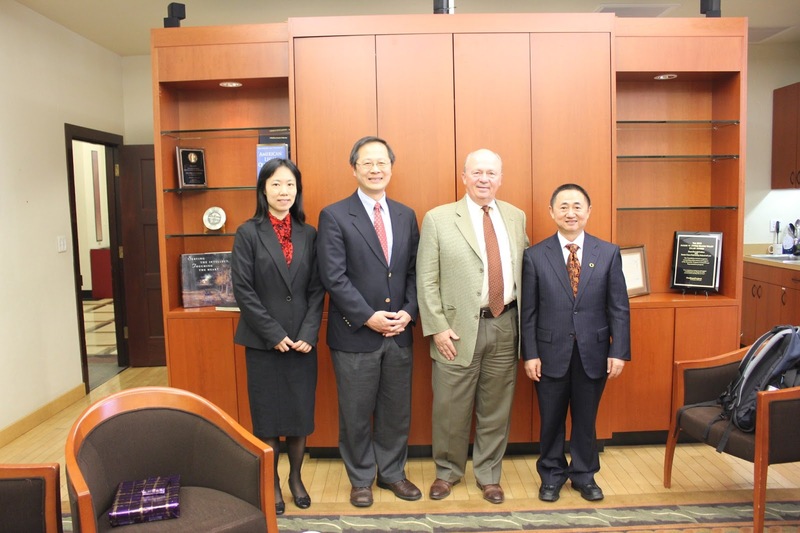 In the past few weeks, we’ve had some of China’s leading public interest lawyers pay visits to Santa Clara University. At the beginning of March, Prof. Wang Canfa of the China University of Political Science and Law paid us a visit. In addition to his academic position, Prof. Wang is also the director of the Center for Legal Assistance to Pollution Victims (CLAPV). Prof. Wang is both one of the leading legal scholars in China on the environment as well as arguably the most important legal advocate in that country working on the environment. In 2007, Time Magazine hailed him as an environmental hero. Much of his reputation derives from his work through the Center for Legal Assistance to Pollution Victims, which he founded and still directs. The Center litigates cases on behalf of pollution victims and has been remarkably (and uniquely) successful in recovering compensation for his clients. In addition, his Center also engages in environmental law training for lawyers and judges. While at SCU, Prof. Wang met with Dean Polden and gave a guest lecture in an undergraduate environmental studies course about his work with CLAPV. He was also accompanied by Professor Zhu Xiaoqin from Xiamen University Law School who is currently a Fulbright Scholar at Harvard Law School. I ended up taking both of them to the Monterey Bay Aquarium where we got a wonderful tour from Dr. George Matsumoto, a scientist at the Monterey Bay Aquarium Research Institute. The other Chinese lawyer we had at SCU recently was Mr. Chen Guangcheng, the blind “barefoot lawyer” who created a diplomatic stand-off last spring in seeking refuge at the US Embassy. And this all happened while Secretary Clinton was in Beijing for the US-China Strategic and Economic Dialogue. 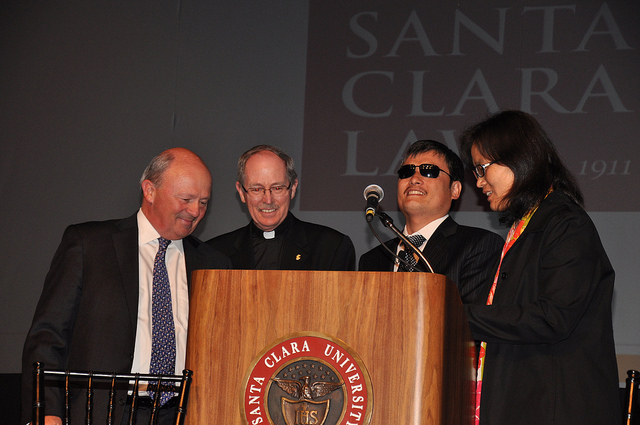 Chen was at Santa Clara University to receive the Law School’s Catherine and George Alexander Prize, where he gave nice acceptance speech to a packed audience. Chen was introduced by SCU President Father Engh. NYU Law Professor Jerry Cohen, probably the best known American law professor focused on Chinese law issues, provided valuable background on Mr. Chen’s past. I ended up on the Santa Clara welcoming committee for Chen, his wife Weijing, and two young children – fancy description of me, Prof. Cynthia Mertens (SCU Law’s Academic Dean), and law student Nathan picking them up at SFO to bring them to their hotel on the preceding Friday. Interestingly, there were many people (especially Chinese) at the airport who recognized Chen and expressed their support for his work. I personally was struck by how unassuming he and his wife were even though they have gone through a tremendous personal ordeal in China and have gotten quite a bit of attention from the media. But it was an honor for Santa Clara to have them come to our campus. I understand from him that he is working on a book(in English), which should be out later this fall.